Cornelis Springer grew up in a family of architects and building contractors in Amsterdam. He initially painted town views which followed the contemporary trend of idealizing the past and the Dutch national heritage. From the 1850s on Springer abandoned the fantasy element in his work and concentrated on existing topographical locations following an increasing interest in topographically accurate subjects. Cornelis Springer was especially inspired by the small harbour town of Enkhuizen. After Amsterdam, its residence, this is the most portrayed city by the master. Enkhuizen was in the time of Springer a quiet small city on the Zuiderzee, now the IJsselmeer. It was very picturesque and much of the seventeenth-century period had been preserved. Springer often visited Enkhuizen and her neighbouring city Hoorn, and already in 1860 he made the first drawings that resulted in paintings. 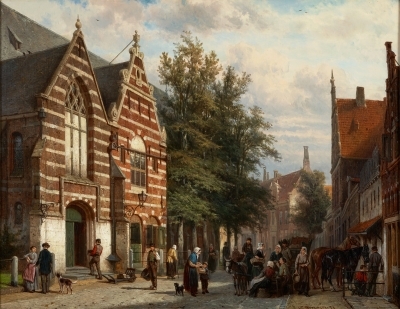 A visit in 1872 would prove very successful because in this and the following year he produced several paintings from Enkhuizen to the drawings he produced in September 1872. 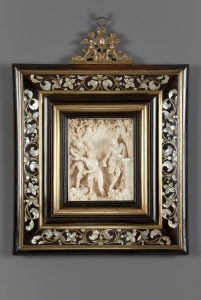 The study for the South Portal of the Westerkerk is dated 2 September 1872 and is kept in the Westfries Archief in Hoorn. The composition of this painting is dominated by the double facade of the southwing of the Westerkerk that radiates in the sunlight. The Westerkerk was first called St. Gummarus Church and its construction began in the middle of the fourteenth century. It is a fine example of Dutch Gothic. Because of the crowds on the street, the painting that is bathed in clear light, radiates a warm atmosphere. This painting shows everything what made Springer famous. The masterly way in which he alternates strong light and shadow, the detailed way in which he portrays the historic facades, the correct representation of reality and the way in which he leads the eye through the winding street to a point of light in the distance. 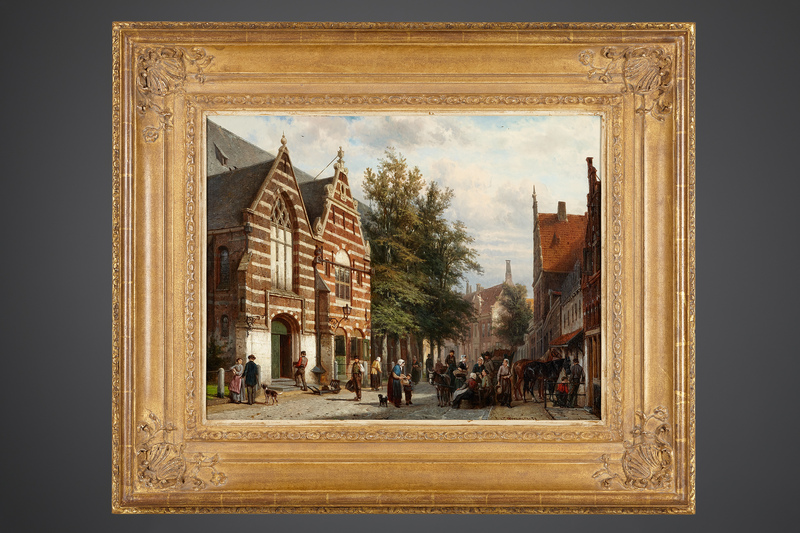 The view of the Westerkerk in Enkhuizen is an exceptionally fine example of the work Cornelis Springer. A.F. Kamp, ‘Springer in Enkhuizen’ in: Uit het peperhuis; Vereniging vrienden van het Zuiderzeemuseum, no.3, juni 1966, p.111, as Westerkerk en Westfriese munt. W. Laanstra, H.C. de Bruyn en J.H.A. Ringeling, Cornelis Springer 1817-1891, Utrecht, 1984, cat.no. 73-11, p.182, as Westerkerk te Enkhuizen bij zomer. A. Ligthart, Door het oog van Cornelis Springer 1817-1893 een ontdekkingstocht langs de steden rondom de Zuiderzee, tent.cat. Zuiderzeemuseum Enkhuizen, Schiedam 2015, p. 86, afb. 100 as Het Zuidportaal van de Westerkerk in de Westerstraat te Enkhuizen.